I think I've told you before how much I love Southern Living cookbooks. They are some of the favorites in my collection. I turn to them again and again for cooking inspiration. In addition to the wonderful recipes, the cookbooks are filled with beautiful photographs and engaging descriptions and essays. 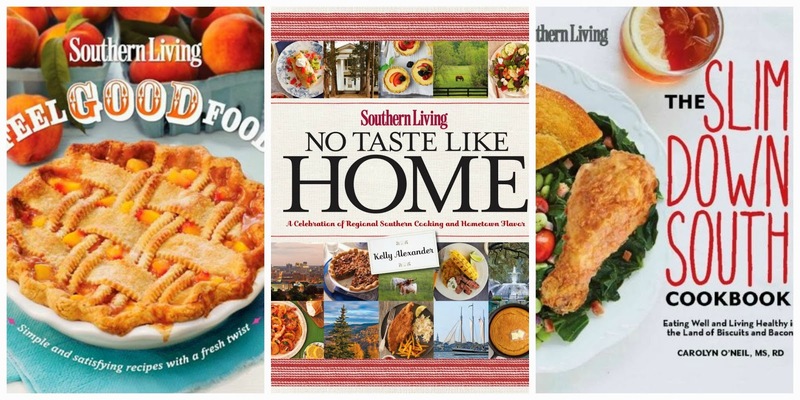 Three recently released titles that I'm currently enjoying are Feel Good Food, No Taste Like Home, and The Slim Down South Cookbook. Here's what each of them has to offer. Feel Good Food: I've noticed changes in Southern Living cookbooks over the past couple of years. The cookbooks now have a contemporary vibe from the photos to the page designs. It just seems so much more updated than the classic Southern Living cookbooks that I have in my collection. Feel Good Food is one of those contemporary cookbooks. The terms that come to mind as I flip through the pages of the cookbook are cheery and sunny. Each page features a bright green design that livens up the place. Livening up seems to be the main theme of this cookbook with chapters named: Rejuvenated, Nostalgic, Gracious, Refreshed, Warmth, Indulgent, and Celebratory. Each recipe features a vivid, full-color photo and the cookbook is enriched with menu suggestions and personal stories. With recipes such as okra-shrimp beignets, strawberry-lemonade muffins, zucchini bacon spoon bread, and sweet potato cupcakes with cream cheese frosting, the cookbook is bound to expand your Southern cooking repertoire. In my kitchen, I cooked the southern-style collards and sweet tea brined chicken. Those recipes just shout Southern Living and eating! No Taste Like Home: I can't think of enough words to describe how wonderful this cookbook is! It is written by Kelly Alexander who takes us on a culinary tour around the south. The uniqueness of this cookbook is that it is divided into regions including the Heart of Dixie (middle and north Georgia, Alabama, and Mississippi), Cajun Country (Louisiana), Big, Bold Texas, the Piedmont & the Mountains (North Carolina and Virginia), the Bluegrass, Boubon & Barbecue Trail (Kentucky and Tennessee), and my neck of the woods the Coastal South (Baltimore, Charleston, Savannah, and Miami). Each region features a detailed description of the area and includes commentary from famous chefs, writers, and celebrities from that area. And, of course, there are tons of recipes. Even though I'm from the Coastal South, I traveled to Cajun Country and made the Hot Crawfish Dip. Now, if you decide to visit the Savannah section of the cookbook, you can feast on Georgia Peach Deviled Eggs, Hoppin' John Hush Puppies with Green Tomato-Corn Relish, and Crispy Oven Fried Chicken. This cookbook is a good investment as there is so much more to it than recipes. It is a reference guide to the culinary south which I will turn to again and again especially when I see a road trip in my future. The Slim Down South Cookbook: When I looked through this cookbook, I was surprised to find that I tend to cook in the same way that is depicted in this cookbook. I don't cook with a lot of butter; I'm definitely an olive oil fan. I also choose to use lower fat options such as chicken broth over cheese and cream. This cookbook comes at the perfect time when I've decided to make some healthy choices with my family's diet. This cookbook is written by Carolyn O'Neil, a registered dietician, and features Slim & Savvy Southerners who share how they make healthy choices in their Southern kitchens. The book also features a 14-day SLIM Eating Plan to help jumpstart your weight loss. This cookbook isn't about limits. This cookbook highlights the limitless ways you can prepare and enjoy a delicious, healthy meal that is full of flavor. Thai Noodle Salad, BBQ Peach Summer Rolls, Hoppin' John Parfaits, Cornbread Crab Cakes, Country Chicken & Buttermilk Soup, BBQ in a Jar should pique your interest. Each recipe is accompanied by a full-page photo that will make your mouth water. Are you concerned that you have to cut out desserts in your slim down? No, this cookbook features dessert recipes, too, such as Angel Food Cake with Lemon Glaze, Classic Strawberry Shortcake, and Key Lime Pie. I cooked Shrimp and Grits (recipe featured below). It was absolutely delicious!! 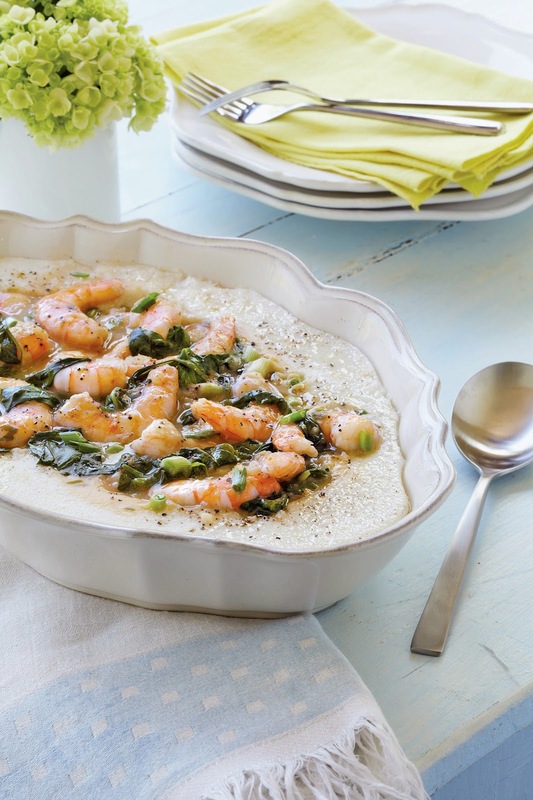 I loved the combination of shrimp and fresh spinach with that splash of lemon juice. You have to try it. Makes 6 servings, Hands-On 25 min., Total 30 min. 1. Prepare Parmesan Grits: Bring ½ tsp. salt and 4 cups water to a boil in a medium saucepan; gradually whisk in grits. Cook over medium heat, stirring occasionally, 8 minutes or until thickened. Whisk in cheese and pepper. Keep warm. Disclaimer: The publisher provided me review copies; however, the opinion expressed here is my own. This is the perfect month to introduce some healthy meals into your cooking routine. I'm happy to have the opportunity to add The Slim Down South Cookbook to your collection. To enter the giveaway, please use the Rafflecopter widget below. Please be patient as the widget loads. The giveaway will run until February 15, 2014 . Thanks for reading A Well-Seasoned Life and good luck!! I have all the Annual Recipe books but none of these. Love SL, still get their magazine every month. Loved your description of the cookbooks! All three of these cookbooks look wonderful. I'm also trying to cook healthier and would welcome a cookbook that would help me do it! Love Southern Living and I DO need this cookbook! I lost all of my Southern Livings along with many other cookbooks in a move several years ago and I just haven't had the heart to start collecting them again. If I won this one, I feel that it would give me a nice new beginning and perhaps a new direction to start a new collection. Thanks for giving all of your fans a chance at this. And Happy Valentine's Day!